I first used our department iPad and AppleTV to project YouTube videos as a storytime extension in Blast Off with Books, our twos and threes program. I’d dim the lights and sit on the floor with the kids as we watched. The set up worked well. Next, I used it to project a book or image that we would sing about. The kids wanted to get their hands on the iPad, but we only had one. 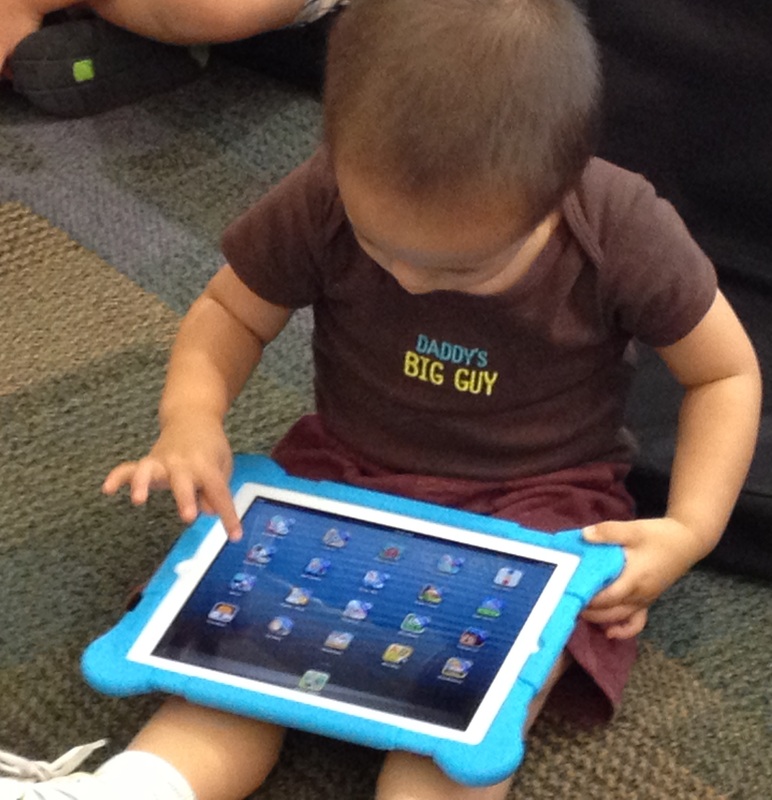 So in fall of 2012, our library budgeted for additional program iPads. 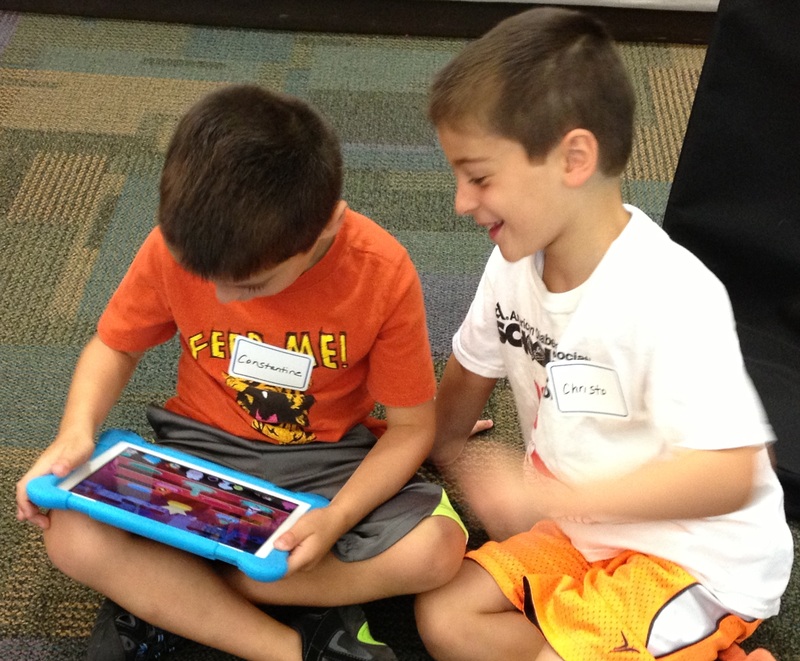 This past summer, I unveiled the 7 new iPads we would have for use in youth programs. My original intention was for caregivers to engage with their children and technology. I envisioned this quaint little scene with caregiver, child, and iPad rocking some active screen time. But because we do not have enough for each child/caregiver pair, everyone has to share. It is this sharing that has changed the interaction completely. I hand out iPads toward the end of storytime and introduce the app of the day, giving basic instructions to the caregivers. I walk around and ask the kids if they can share with their neighbor, often separating siblings. 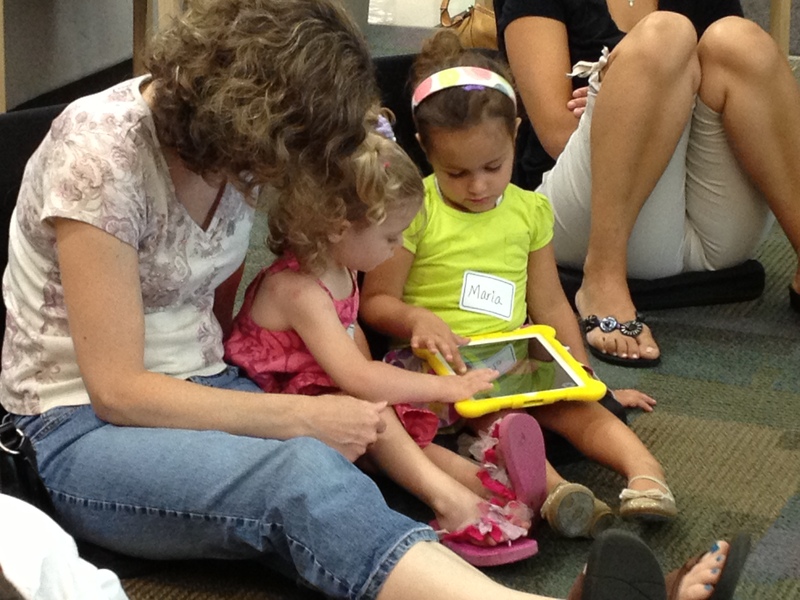 The children rarely know each other prior to walking in the door to storytime, and the iPads are a way for children to socialize and teach each other about the app they are using, often without any verbal dialogue. They watch each other try something and if it works, they can do it. If it doesn’t work, then the kids try something else. Caregivers chime in when sharing is a struggle, but I’ve found, for the most part, that the children want to show each other the apps. They take turns tapping or navigating through the app. Not only are the children learning to share, they also have to return the iPads. I ease this transition by swapping out the iPad for an egg shaker. I asked, and our administration made program iPads happen. I know that is not the story for many librarians out there. We are lucky here, but the socialization between children—not just with caregivers—that the iPads inspire may give you even more leverage in your argument for tablet technology in your storytimes. The Vernon Area Public Library District serves a population of approximately 41,000 comprised of a 32-square-mile area in the northern suburbs of Chicago, Illinois. Posted on November 18, 2013, in Apps, Story Time and tagged Heather Blake. Bookmark the permalink. 1 Comment.